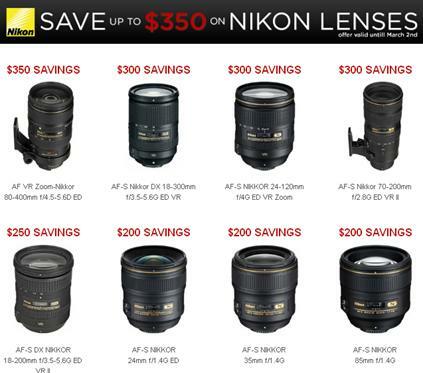 Amazing as Nikon NEVER puts their lenses on sale. Guess I can not say never again, eh? Feast your eyes on these beauties including a few of my favorites: 80-400VR, 18-200VR (DX), 28-300VR (FX) and the Nifty-Fifty: 50mm f/1.8. Below are a few of the lenses. Click here or on the image below to see the entire list. Hurry, sale ends on March 30, 2013.
Who knows when Nikon will do this again. This entry was posted in Event and tagged camera, digital, dslr, lens, lenses, limited time, nikon, sale, slr. Bookmark the permalink.